Ahh Dublin airport, it’s been a few months! A quick scoot about the usual shops and a wee stop in to burger king for a travellers breakfast and we were set to go! A small delay on the plane meant a tighter squeeze for catching our train, but we still had an hour and a half to get to the station once we landed. The bus from the airport to the main train station leaves every half hour and only costs 60 koruna (£2.09), but when the nice lady at the info desk says it takes 30 minutes to reach the main train station don’t believe her, it was double that! Not a good sign when the bus was only leaving at 3:30 and you’ve got a 4:24 train to catch! 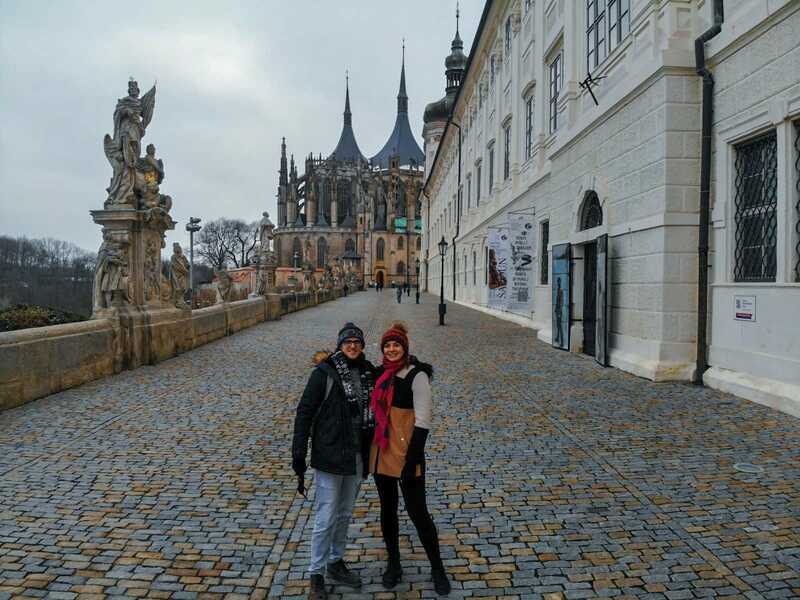 As soon as we seen the time disappearing we immediately contacted the guys at Interrailing Packages and they helped us find different train options we could use, luckily there was a train going every half hour to Kutna Hora and it was quickly sorted! So on through Prague station we go, getting a quick bite to eat in the shop for the train journey. Once the platform popped up on the screen we shot straight for platform 6 and sat with our sandwiches. Some trains can have reserved sections so it’s always good to check on the ticket holder outside it if they’re reserved or not. Because of our delay we didn’t have a reserved seat but we quickly found a spot sitting with two locals in a little room that looked right out of the Hogwarts express! We were able to use the interrail planner app to follow our journey and make sure we got off after the right number of stops, because the train didn’t have any announcements we could hear. So up we hopped when we landed in Kutna Hora and out we got, to one of the smallest stations we’ve been in. Usually at train stations their are taxi men queuing up to whisk you away but not in Kutna Hora! There was one taxi man standing outside the tiny station, thank god, he saved us a 30 minute walk in the cold! We got to our hotel, “Hotel U Kata” within 5 minutes and it only cost us 100 koruna (£3.51). Check in was smooth, all the info interrailing packages gave us was everything we needed to get the process going. After the usual forms etc we got the important info, breakfast is 7am-10am! We got straight up to the room, a nice spacious double with a big ensuite bathroom, and sat for half an hour to relax after a days travel and plan out the night ahead! We decided to go out and walk towards St Barbaras Cathedral, and see what interesting things were along the way. Our directions took us through the windy cobbled streets of Kutna Hora and we came by a massive Christmas tree in the middle of the square, there was hardly anyone on the streets bar us and of course a man selling hot wine out of a log cabin! After that we ended up at St Barbara’s, and oh my god! We were there for ages and only came across three or four locals walking their dogs, no tourists at all! We snapped a few pics and then went in the hunt for some food yet again, we were looking for local spots for some Czech pork and dumplings but it was 9pm on a Tuesday and everywhere was closed, so pizza it was! For 215 koruna (£7.51) we got a massive pizza literally the size of a wheel, a sprite and a local beer. The pizza settled a bit too well and we hit the wall after a long travel day, so back through the streets of the world heritage site we went and headed for the hotel to get some much needed sleep for the day ahead!